If you read this blog, you know that I’m all about finding ways to increase productivity and minimize distractions. And the more and more I use Slack, the more I hate it because it’s a constant stream of distractions. I’m not alone. See here, here, and here. Don’t get me wrong – Slack is an extremely well-designed, well-built platform. The integrations are great and the ability to build tools and bots on top of it is pretty awesome. It’s a valuable messaging tool, which is why the company is the fastest growing business app ever. The underlying philosophy of Slack and many business communication apps – a stream of messages with little organization – is what’s bothersome to me. Imagine you work on a remote team and you’re 12 hours ahead of most of your team members. While they’re in the middle of their work day, you’re deep asleep. Not only will you be bombarded with notifications, but you’ll also wake up to a cacophony of messages with very little idea of what subject was started where and by whom. Another example is going on vacation. I was on a two-week trek to Thailand and got pinged with many messages that had nothing to do with me. The messages that were relevant to me were buried deep in multiple channels. I actually didn’t realize I missed messages until one of my co-workers asked me if I saw the message he sent to me. And I know that I’ve sent many messages that were missed or unread. At the core of the problem is notifications. Yes, you can set certain your notification preferences – such as seeing all notifications, only those messages that mention your name, or no notifications for a channel. Those aren’t granular enough, and I find that I still miss a lot of stuff no matter which option I choose. And all you hear all day is that knock brush sound. Another issue is that Slack doesn’t provide you with email notifications, so it forces you to use its tool to check notifications and messages, which again leads to missed messages. This is great for their engagement metrics, but not great for productivity. 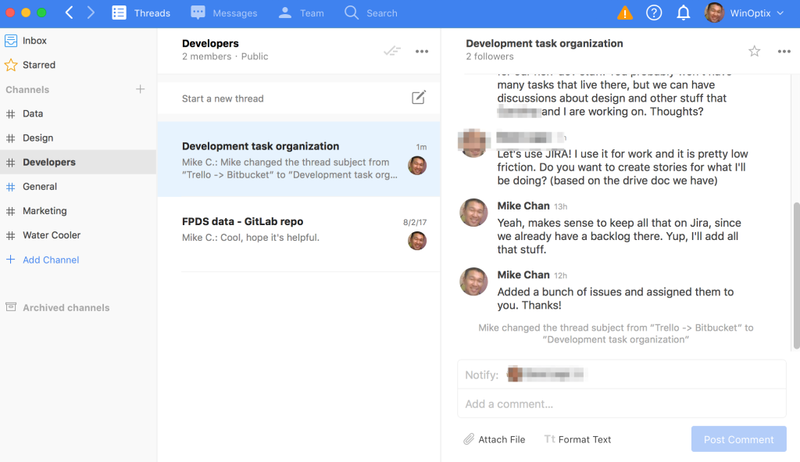 I’ve been using a relatively new messaging tool called Twist, which is built by the same company who created the popular Todoist productivity app. The philosophy and benefits of the tool are laid out nicely in this Medium post written by Twist’s creator. We use Twist for WinOptix. Our team is pretty small (only 3 of us, all part-time), so our message volume isn’t very high. But we’ve already seen benefits from the different approach Twist has taken to messaging. Like Slack, Twist has channels that you can denote subjects for, such as “Design”, “Development”, “Marketing”, and more. But Twist goes one level deeper with threads within each of these channels. So under “Development”, we have a thread for “Development Task Organization”, where our developer and I discussed the best way to organize development tasks, and “FPDS data – GitLab Repo” where we talk about how to access troves of government contracting data. These threads portray the messages in a more granular fashion so you have a better idea of what the conversation is about. The next big feature is the ability for the sender to select who receives notifications. This is HUGE. Let’s say that I just want to ask our developer a direct question. I’ll just select his name in the “Notify” field and ask away. He’ll be the only one who receives a notification. Everyone else who is part of that channel will be left alone but will still be able to view that message at any time. This is the best of both worlds. This gives the sender the power to minimize distractions for his or her team, not just the receiver to minimize distractions for herself. In Slack, you can type “@username” to specifically mention someone in a message, but if other employees in that channel have selected to receive notifications for all messages, they’ll still get pinged with this message. I might be old-fashioned, but my email inboxes are the center of my work life. Anyway, I love how Twist sends me email notifications about messages that have been recently posted. This allows me to see if I missed anything important without having to check all of the messages in the app itself. And the asynchronous nature of email lets me review messages whenever I please. This may seem like I’m hating on Slack, but I’m not. It’s a really great piece of software, but it just doesn’t work all that well with the way that I work. And I’m not getting paid by Twist to write this post. I just think it’s a very well thought-out tool that focuses more on productivity as opposed to just communication. The caveat here is that we don’t yet have a high volume of messages, but I think that the way Twist is set up, ramping up the volume won’t be as distracting. Anyway, if you’re frustrated with the constant pinging and missed messages, I’d suggest giving Twist a shot. If you do, let me know what you think!